"My late Mother in law, Mary Capp Bowan, used to make these wonderful cookies. 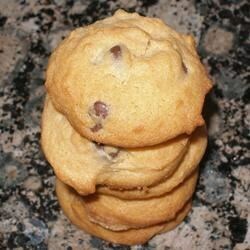 As long as people don't know the secret ingredient, they will love these cookies!" In a medium bowl, cream together the shortening, brown sugar and white sugar until smooth. Beat in the eggs, one at a time then stir in the vanilla. Combine the flour baking soda and salt, stir into the creamed mixture along with the ketchup. Fold in the walnuts and raisins last. Drop by rounded spoonfuls onto the prepared cookie sheets. I have tried this cookie recipe and I discovered that I did not like these cookies at all.